This vitamin intake can cause two problems in the organism. The first one is originated when the system takes excess of this substance generating toxicity levels, which can be acute – caused by accidental ingestion, especially in children – or long-lasting. The results of this poisoning are reflected in variations in the skin, hair, and nails. This can be clinically controlled and an adjustment in the dose is the remedy for this situation. Constant and persistent skin infections. Acne, dry and scaly skin. Infections in the throat or presence of ulcers in the mouth. Sore eye lids and dark lighting poor vision in extreme situations. Thinning and ulceration of the cornea at advanced stages. Perforation of the cornea as well. Blindness caused by the structural retinal damage. To avoid this condition, it is recommendable to intake food rich in this element. 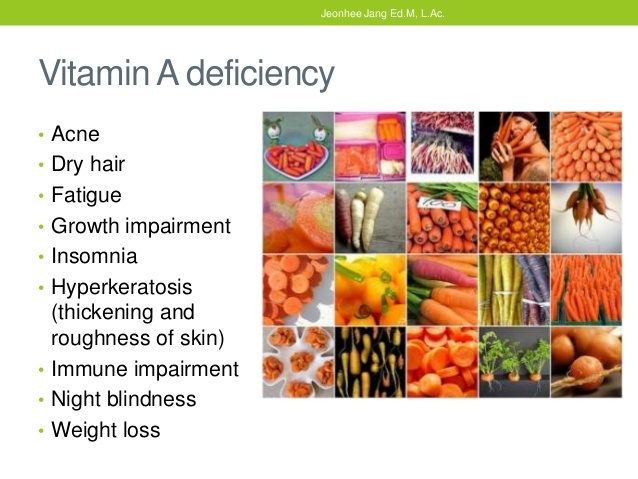 There are a lot of foods that contain vitamin A like chicken, eggs, beef, liver, carrots, fortified milk, mangoes, sweet potatoes and leafy green vegetables. Additionally, it can be found in egg yolks, animal butter and whole small fish (with no removal of the liver). Breast milk is also a good source of this vitamin, so that is why pediatricians recommend to breastfeed children for a period up to six months.